With Democrats controlling both chambers of the state legislature, lawmakers have reached agreement to include the plastic ban in a broader framework of budgetary measures to be voted on by Monday. If the bill passes, the ban on single-use plastic bags—which still allows for several exemptions—would take effect in March 2020. "I think we're going to look back and wonder why this isn't something that was commonplace before now," state senator Todd Kaminsky told NBC television Thursday. "But I'm glad we're doing it now and leading the way." Governor Andrew Cuomo tried unsuccessfully last year to prohibit the bags. "For far too long, these bags have blighted our environment and clogged our waterways," he said recently, adding that the ban would "protect our natural resources for future generations." Despite plastic's notoriously harmful impact on the natural environment and on wildlife, few American states—with the exception of environmentally-minded bastions on the West Coast—have pursued legal restrictions. The European Parliament approved a ban Wednesday on numerous plastic consumer products, including straws, cotton swabs and plastic wrapping. The measures are to take effect in 2021. New Yorkers use some 23 billion plastic sacks a year, Cuomo said last year. 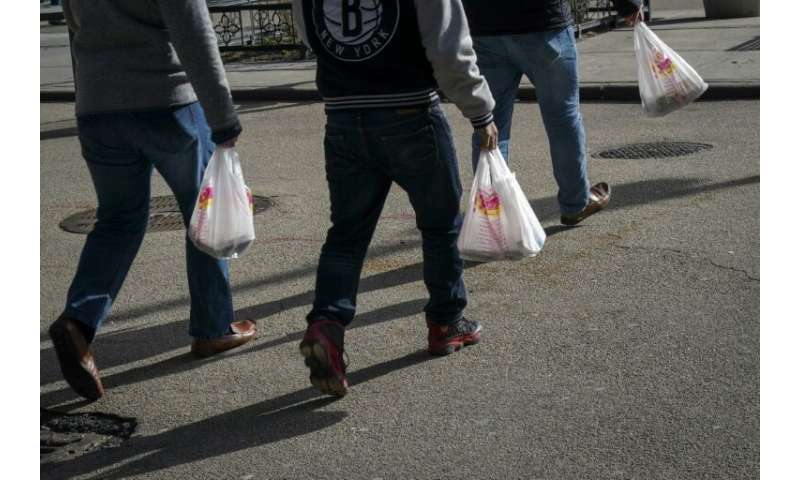 In New York, a temple of consumerism with 8.5 million inhabitants, supermarkets generally provide free plastic bags, sometimes doubled for greater solidity. In 2016, the city passed a law to impose a five-cent tax on each plastic bag, but it was overturned at the state level. Under the new legislation, New York counties would be able to levy a five-cent tax on paper bags, with part of the resulting revenue going to an environmental-protection fund. California banned plastic bags in 2014. They are banned in much of Hawaii, since that state's most populous counties now prohibit their use. After Europe, another great news this time from New York! Hope other states and countries do similar.